Bring your next project on the go with the Power Dock! Equipped with on-board battery management, the Power Dock allows you to recharge and monitor battery levels, while providing a header to connect Onion Expansions. The Expansion Header is a convenient tool that gives you easy access to the Omega’s GPIOs, and allows you to connect Onion Expansions directly. 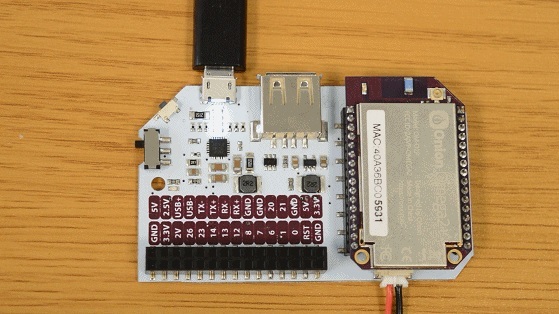 The Expansion Header is labelled to show you what GPIO is connected to each section. 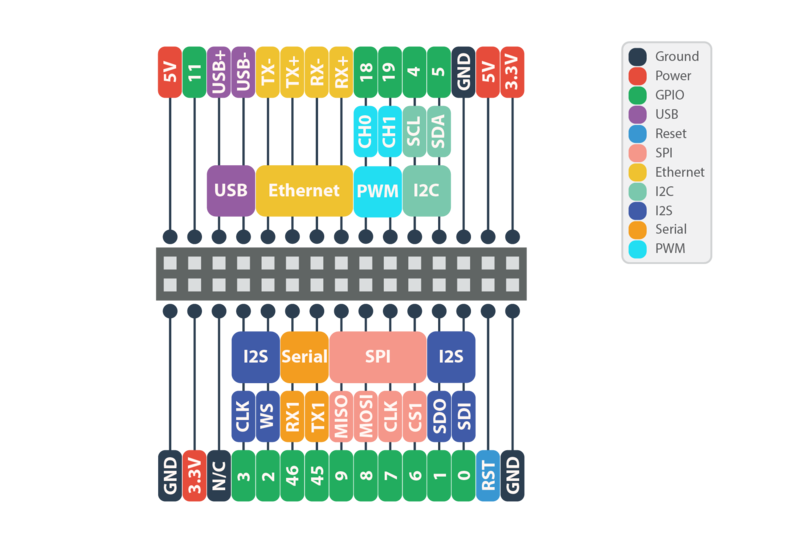 By default, the Serial, SPI, and I2C pins implement these communication protocols and cannot be used as GPIOs. Similarly, the I2S pins are set to GPIO mode by default. To learn more on changing the functionality of the Omega’s pins, see the Multiplexing GPIOs section of our article on the Omega’s GPIOs. The Micro-USB Port is used to supply power to the Power Dock. Connect the Dock to a power source such as a computer or a USB wall adapter to recharge your battery, or to use your board without a battery. The blue Power LED indicates if there is power flowing to the Omega. The power dock contains 4 LEDs that indicate the current battery level and charging status. The LED closest to the Micro-USB port indicates the lowest battery level and the LED furthest away from the Micro-USB port indicates the highest battery level. We have added an ADC chip to the Power Dock 2 in order to measure the voltage level of an attached LiPo battery. 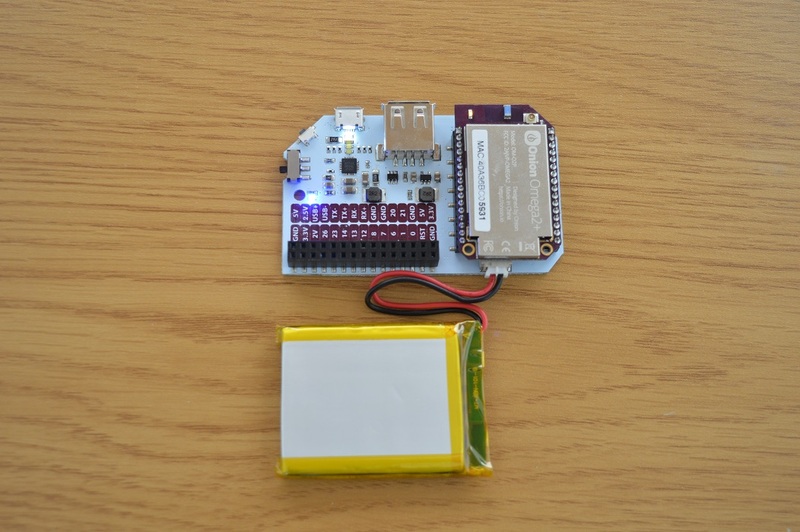 From now on, you can get a precise voltage of a battery just by issuing a single command. It will give you a better idea of how much charge is left in order to satisfy your needs. Expect a 1500mAh battery to last about 10 hours, in some cases, up to 12 hours. Warning: Do not attempt to charge your battery with anything other than the Power Dock or a charger designed specifically for LiPo Batteries! The Reset Button on the Dock is connected directly to the Omega’s Reset GPIO. Pressing this button do one of two things: reboot, or factory restore. Momentarily pressing the reset button and letting go will initiate a reboot of the Omega OS. Pressing and holding the reset button for 10 seconds then releasing will trigger a factory restore. Warning: This will reset your Omega to the default filesystem of the last firmware update, this will delete ALL of your data! The Omega’s USB Port can be used to connect to all sorts of devices, namely a USB storage device to extend the storage space of your Omega. The USB port supports USB 2.0, and is a type A connector. What differs Power Dock 2 from the original Power Dock is that it has the Battery Level ADC that allows you to accurately monitor the voltage of your battery. Another update is that GPIOs 18 & 19 are now available on the Expansion Header! 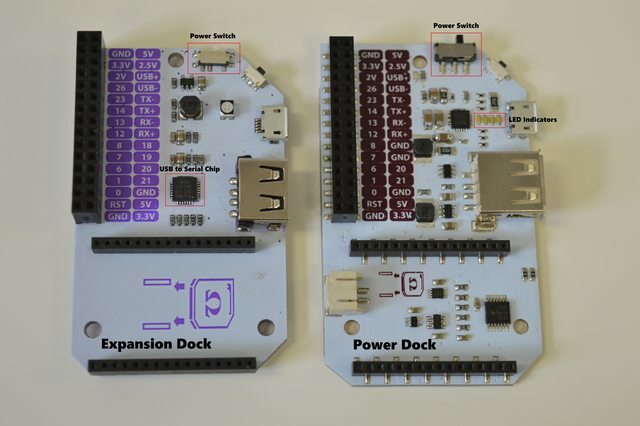 The Power Dock operates in three different modes. This is the most important mode; when the Omega and Power Dock are running completely off the battery. The LED Indicators will be turned off by default to conserve battery life, however they can be turned on for five seconds via a command from the Omega. When both the battery and Micro-USB cable are connected to the Power Dock, the battery will be charging. The Omega can still be powered on while the battery is charging, but it doesn’t have to be; the battery will charge in this mode regardless of what the Omega is doing. You can even disconnect your Omega and the battery will still charge! For best results, use a short Micro-USB cable when charging. The Power Dock essentially acts like the Expansion Dock in this mode. The power-dock2 application allows you to turn on the Battery Level indicator LEDs as well as output the current voltage of the battery on the screen. You can monitor the voltage on the command line while it is in Battery mode or Stationary mode. However, for the Batttery Indicator LEDs, it will only take effect when Power Dock is in the Battery mode.